Enter your email to receive our latest news! Copyright BOND Events 2017 © All rights reserved. 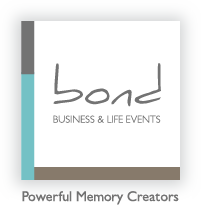 Bond has the right to process any personal data voluntarily provided by users/visitors in accordance with Greek and EU laws. Users/visitors to the website acknowledge and accept the keeping and processing of their personal data for the supply of the services requested from Bond. Bond shall keep personal data by using security procedures and providing the highest possible level of safety and confidentiality to the users’ personal data. Every data subject has the right to obtain from Bond at any time, on request, confirmation as to whether or not personal data relating to the data subject are being processed (right of access, Article 12, Law 2472/1997). Access to our database is possible only if someone has legal interest and right and upon the public prosecutor’s order. The data subject is entitled to object anytime to the keeping and processing of his/her data (right of objection, Article 13, Law 2472/1997). Users/visitors shall be liable in case of submission of personal data of third parties to Bond without third party authorization, as well as for the submission of false, incorrect or inaccurate information and data with the purpose of deception or fraud. In the event that access to webpages or services of the website requires a username and password and/or further information (e.g. e-mail, first name, last name, landline number, mobile number, age, address) users/visitors shall be solely responsible for any leakage or arbitrary or unlawful use of these by themselves or third parties. Bond respects your personal information. Unfortunately, data transmission over the Internet can never be guaranteed as completely secure. Bond cannot ensure the security of information transmitted via the Internet, either from you or to you. The operation of this website is governed by Greek law and any dispute deriving therefrom shall be referred to the exclusive jurisdiction of Greek Courts.